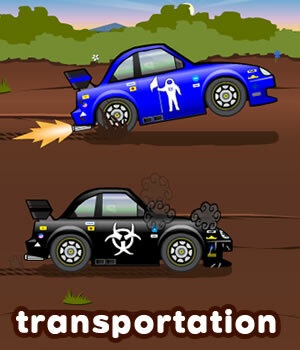 This lesson will teach students how to talk about means of transportation in English. 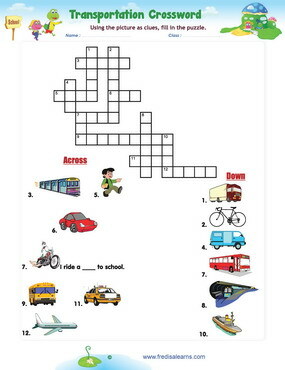 Students will learn means of transportation vocabulary and expressions. This English lesson will teach students how to ask a number of ‘how,' ‘where’ and ‘when’ questions – a focus on three question words. The worksheets below are useful for offline and classroom activities. These printable exercises directly correlate with the above lesson 'Transportation'. Every worksheet comes with an answer sheet on the second page for educators. Dad is about to leave for the city. The children want to come. They are going to the airport to pick up Freddie’s aunt, Mona. On the way, they choose different means of transportation and talk about it. They also ask many questions relating to the length of time. Are you going by car? How do we get to the subway? Where does this train go, Dad? When does Aunt Mona arrive? She arrives in five minutes. How is she going to arrive? It arrives in five minutes. How long does it take to get to the car park?